BYGL readers should be familiar with the Basswood Leafminer (Baliosus nervosus; previously Baliosus ruber). We've reported on the skeletonizing and leafmining activities of this native beetle on its namesake host, American basswood (Tilia americana) for years. High populations cause entire basswood trees to become reddish-brown. Although the leaf damage is just now becoming noticeable, travelers on the northern portion of I-75 in Ohio will soon be treated to "flaming" basswoods gracing the woodlots along the route. Peak color usually occurs in mid-to-late August. The leafminer is most often associated with American basswood (a.k.a. American linden) as well as other members of the Tilia genus such as little leaf linden (T. cordata) and silver linden (T. tomentosa). However, the scientific literature notes the beetle may attack a wide range of hosts including birch (Betula spp. ), elm (Ulmus spp. ), American hophornbeam (Ostrya virginiana), maple (Acer spp. ), oak (Quercus spp. ), willow (Salix spp.) and some fruit trees such as apple (Malus spp.) and cherry (Prunus spp.). There was even a paper published in 1982 assessing the damage potential to soybeans. The basswood leafminer is closely related to the locust leafminer (Odontota dorsalis) which can cause black locusts to become "flamed" in late summer. Both belong to the leaf beetle family Chrysomelidae as well as the subfamily Cassidinae (Tortoise Beetles and the Hispines) and the tribe Chalepini. Both beetles were once grouped in the now defunct Hispine sub-family which is why the older literature refers to basswood and locust leafminers as "hispid beetles." Hispids share similar life cycles and life styles including adults feeding as leaf skeletonizers and larvae feeding as leafminers. 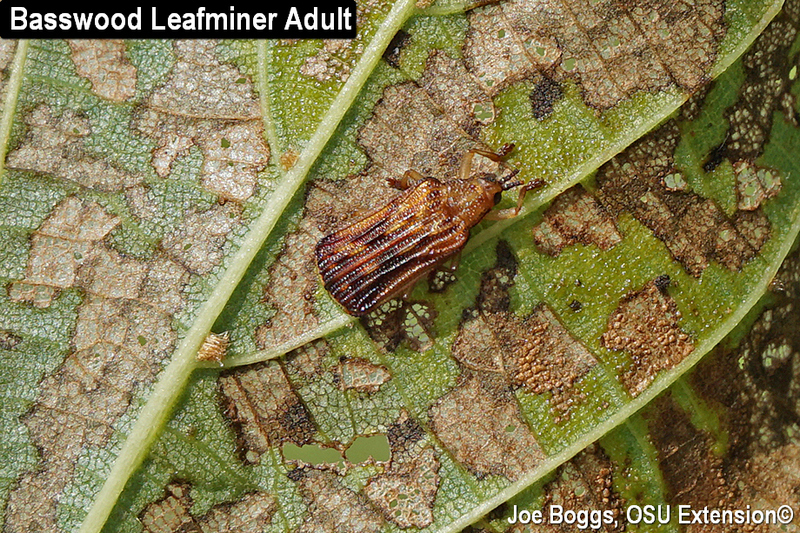 Basswood leafminer adults are wedge-shaped and around 1/4" long; females are slightly larger than the males. There is a single generation per season; however, as with the locust leafminer, adults are present at two different times during the growing season. Adults spend the winter in leaf litter beneath host trees. They emerge in the spring to feed as skeletonizers on newly expanding leaves. The damage may be noticeable when viewed up close; however, it's seldom severe enough to cause entire trees to change color. Eggs are laid in June with females inserting single eggs beneath the upper epidermis at the edge of an area where they have skeletonized. The resulting grub-like larvae feed as leafminers between the upper and lower epidermis. The blotch-like leaf mines contain a single larva at first, but may eventually house several larvae as mines coalesce. Pupation occurs within the leaf mines and new adults emerge in August. The leaf feeding damage from this new crop of adults combined with the larval leafmining activity is responsible for the annual flaming of basswoods. Although the beetles are considered leaf skeletonizers, their damage is most accurately described as "surface skeletonizing" or scarifying. The small adults have mandibles that are too small to chew completely through the leaf; they can only remove the leaf surface. Adults may feed on the upper or lower leaf surfaces. The epidermis on the opposite side of the damage dehydrates and degrades leaving behind a fine-textured matrix of skeleton-like leaf veins. This is unlike the coarse skeletonizing caused by Japanese beetles which use their much larger mandibles to consume everything but the larger leaf veins. Of course, as I observed last Friday in northwest Ohio, both the leafminer and Japanese beetles can be found on the same trees causing leaf damage. I also found bagworms adding to the leaf carnage; a reminder that trees seldom deal with one insect pest at a time. At one time, I was perplexed as to why it seemed basswood leafminer was confined to the northern part of Ohio; I've only seen it once on a small basswood in the southwest part of the state. I now believe the reason may be connected to the "preferred" host status of American basswood. Although the leafminer may attack a wide range of hosts, I'm speculating that high populations are most closely associated with American basswood. The native range for this tree includes all of Ohio; however, as the Ohio Department of Natural Resources, Division of Forestry, notes on their website, "In Ohio, it is found in the northern and western portions of the state."